So today was the day I ventured to Hobbiton. I took the tour that provided transport from Rotorua. We meet at the Hobbiton shop in Rotorua, where #Minifigmerry got to meet Gandalf. The drive from Rotorua to Matamata was about an hour, and while we were driving there were a view videos about the process of creating (and tearing down, and recreating Hobbiton), and our guide also kept us entertained with local stories and sightseeing. Again – I am finding that bus is a great way to see the lovely NZ countryside. One of the coolest things he shared with us was about these metal sculptures in one of the towns we passed through. The town Tirau was the first place that Steven Clothier made and placed one of these sculptures, which are made of corrugated iron – just like a roof. These sculptures line the town now, and are really pretty cool, if not a little kitschy. The Dog, was the first sculpture, and was completed in 1998. You can read more here, and see more (and much better pictures than my blurry from the bus pictures below) here on his website: http://www.corrugatedcreations.co.nz/. He has probably made a sculpture of most everything you can imagine – animals, plants, flip-flops, even Jesus! After the drive, we arrived at the Alexander Family Farm – and it truly felt like we were in the shire as we drove through the rolling farmland. 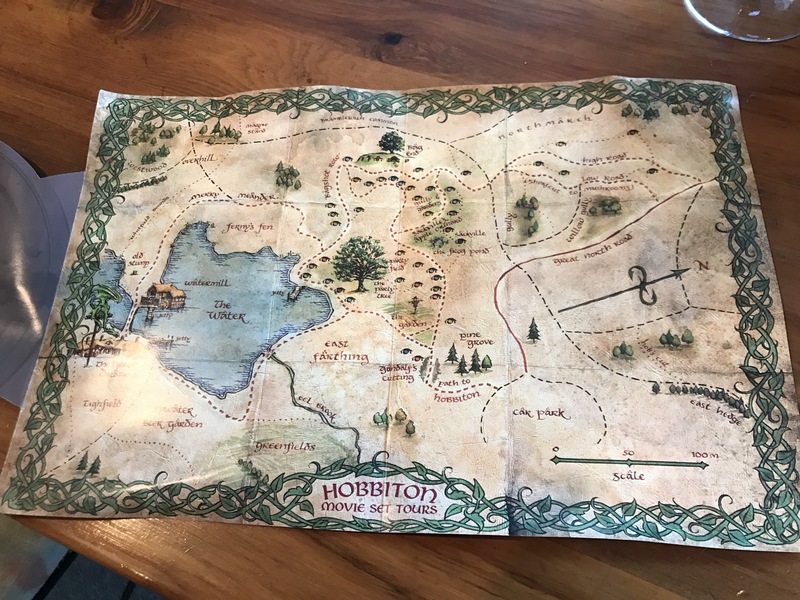 Some history about Hobbiton – This farm was used for both the Lord of The Rings and The Hobbit trilogies. Sir Peter Jackson discovered this farm in 1998. The built the set for LoTR, and then promptly destroyed it. It was a condition of the contract, both with the Alexander family and the movie studio that the farm be returned to “it’s natural state” and that all filming artifacts be removed, as the movie studio owned all of the intellectual property and creations. 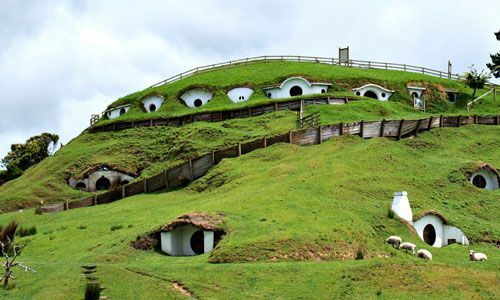 However, the weather did not cooperate completely with that plan, and in 2000, once filming at the Shire was a wrap, an attempt at demolition was made, and they were unable to do it because of an unseasonably wet season. The Alexander Farm was left with only about 17 plywood facades, with a plan to demolish once they could do that with out disturbing the land. However, the power of a fairly obsessive Tolkien fandom is strong, and even with very little remnants of the set, the Alexanders found themselves with lots of “visitors”. In 2009 Peter Jackson got the negotiations completed to film the Hobbit Trilogy, and he returned to the Alexander’s Family Farm to film – and the rest is history – as a part of the contract to use the space, the agreement was made to keep the set “intact” using more sturdy construction, and the current Hobbiton was born, with 44 completed Hobbit holes. The hobbit holes that are the “same” are different sizes for perspective. (Gandalf and Frodo size, for instance). At many hobbit holes you can see the trade of the residents – there are beekeepers, fishermen and more – see what you can find. Many of the holes never even made it into the movie at all – again – Sir Peter Jackson has a crazy attention to detail. There are no rooms behind the doors – they are just dirt floors, mostly used for garden storage. Thankful that the rain held out for the tour, I enjoyed my nice stout, then we got back on the bus, headed back to Rotorua, and I still had the afternoon to explore, but I will put that in the next post. Also, as another cool side note, one of the streets was called “Merry Meander” – guess where it leads? Straight to the Green Dragon – coincidence? I think not!